RAMONA, CA -- Go big or go home. That most American of expressions perfectly fits this latest chapter in Cadillac’s comeback story. For a brand on a mission to rejoin the automotive aristocracy, it’s not enough to just compete effectively at the mainstream core of the luxury market. Cadillac also needs a player in the flagship segment, where autodom’s elite brands display the ultimate expressions of their craft. The CT6 is Cadillac’s new candidate for the full-size prestige category. At 5.2 metres long it is 50 mm longer and a tad roomier than its current top sedan, the FWD XTS, and sits on a new Omega rear-wheel-drive architecture with available AWD. Sizewise the CT6 also splits the difference between the short- and long-wheelbase versions of Euro rivals like the Audi A8, BMW 7 Series, Jaguar XJ and Mercedes-Benz S-Class. The interior dimensions confirm that its exterior size fully translates into competitive rear-cabin roominess, key for the Chinese market, where luxury-car owners are far more likely to be chauffeur-driven. But at the same time as the CT6 team kept its eyes on the size ball, it was also on a mission to make the CT6 drive small. Even more than the ATS and CTS, the CT6 is a featherweight among its peers. 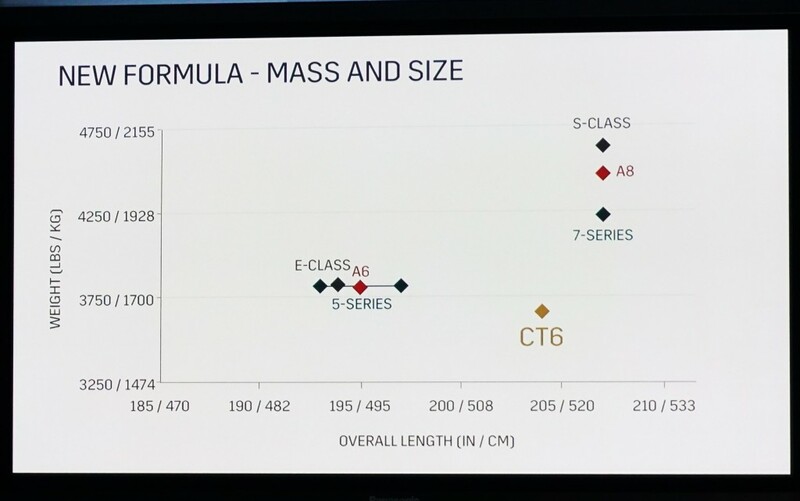 In fact, the full-size CT6 weighs virtually the same as the CTS, which is a lightweight even by mid-size standards. Cadillac’s claims the base CT6 weighs almost 1,000 lbs (436 kg) less than the lightest S-Class, but that’s not exactly apples-to-apples. The base CT6 has a four-cylinder engine and RWD, while the lightest S-Class sold in Canada has a turbo V-6 and all-wheel drive. Still, even the CT6’s own AWD V-6 versions are at least 240 kg lighter than the trimmest S-Class. Only the all-aluminum Jaguar XJ comes close to matching the leanness of the CT6. The Cadillac’s own body is only 62% aluminum. Executive chief engineer Travis Hester says steel has advantages in NVH suppression, so it was used mainly in the passenger cell. For its “drive small” mandate, low mass was just the starting point. Another key enabler is active rear-wheel steering (ARS). At parking speeds the rear wheels steer out of phase to trim the turning circle from 12.2 to 11.3 metres. At normal driving speeds they steer in-phase with the fronts to enhance both stability and agility. The ARS is incorporated into a five-link rear suspension, while the front is supported by short/long-arm suspension and steered by electric power steering. Magnetic Ride Control is combined with ARS and 20-inch wheels in the available Active Chassis Package, and all except the four-cylinder models are AWD. The four-cylinder engine is the familiar 2.0-litre turbo, rated in this application at 265 horsepower. The step-up V-6s come from GM’s all-new V-6 engine family and generate 335 hp in natural-aspirated 3.6-litre guise, or 404 hp as the top-of-line 3.0-litre twin-turbo (exact displacement of the 3.6 is actually 3,649 cc, versus 3,564 on the previous 3.6). Transmissions are eight-speed automatics across the board. The 2.0 starts at $61,245, which puts it in company with mid-size opponents such as the (AWD) BMW 528i ($60,500) or Jaguar XF AWD ($61,400). A modest step up to $63,570 gets the 3.6 AWD which undercuts similarly powered mid-size alternatives such as the Mercedes E300 ($65,500) or Audi A6 3.0T ($70,200). The CT6 3.0 Twin-turbo starts at $73,103 and tops out at $99,220 for the nothing-left-to-add 3.0TT Platinum; compare that with SWB full-size rivals that range from $85,300 for the Audi A8 through $92,550 for the Lexus LS460 to well over $100K for the entry-level BMW 7 Series and Mercedes S-Class. We’ll leave it to you to compare bells-and-whistles counts at those prices. The CT6 model mix includes four trim levels which may or may not include the Active Chassis Package and/or various combos of electronic nanny and co-pilot features. Suffice to say that around $81K would get you a one-down-from-top-trim 3.6 AWD with active chassis, adaptive cruise, advanced night vision and front and rear automatic braking. Our first experience of a moving CT6 was from the rear seat riding in from the airport. While my car guy ears noted the sonorous exhaust of its 3.6-litre V-6, my body enjoyed armchair comfort and ample knee-room. But with the front seat set low, there wasn’t enough foot-room to let me stretch my legs. If I was being chauffeured in my own CT6, I’d insist the seat in front be powered high, whether occupied or not. For my first drive I heeded chief engineer Hester’s comment that the four-pot “is the most surprising engine” and grabbed a 2.0T. Ample at-the-wheel adjustability quickly dialed in a spot-on driving position. A quick scan of the cockpit noted a fairly traditional layout with a PRNDM shift lever, and a 10.2-inch touchscreen integrated into the centre stack (with the option of controlling it indirectly through a touch-pad on the centre console. But the door mirrors are small, and the pioneering interior rear camera mirror, which looks so good on paper, displayed an unexpected downside in practice: for an action that is normally performed “at a glance,” it requires too much refocusing of the eyes for my taste. Hester was right about the “surprising” 2.0T, and not just in terms of its remarkable refinement and effortless performance (some launch lag was noticeable, but forgivable given the test route’s relatively high altitudes). With the lightest engine, and no front-drive axles burdening the front wheels, the 2.0T doesn’t miss the rear-wheel steering available on the AWD models. It feels light, balanced and eager to play. Cadillac does some of the best steering in the business these days, and I liked it best in Tour mode; the additional effort in Sport feels artificial. Ride comfort was never less than excellent, on admittedly benign southern-California roads. Highway cruising is sublimely relaxed, with well under 2,000 rpm on the tach at 120 km/h. And my 150-km mostly-uphill drive to lunch concluded with 9.5 L/100 km on the trip computer. defaults to 50/50 front/rear in Snow/Ice mode, 40/60 in Tour, and 20/80 in Sport. And that 404-horse twin-turbo V-6? A couple of all-too-brief bursts of pedal to the metal confirmed plenty of thrust, but I’m not sold on the underhood sound track. It's a little too intrusive to invoke iron-fist-in-a-silk-glove analogies, yet too blustery to qualify as desirable engine music. Big picture? Cadillac is reformulating the prestige sedan here, and I like its thinking. The CT6 has the size, the space and the presence of full-size alternatives, the agility and fuel economy to match or beat most midsizers, and a price range that fits neatly within the extremes of both categories. The comeback continues. Power/Torque: 2.0: 265 hp/295 lb.-ft., 3.6: 335 hp/284 lb.-ft. & 3.0 TT: 404 hp/400 lb.-ft.